Quail Ridge Engineering offers a full line of bucket elevators. Centrifugal discharge, continuous discharge and high speed elevators are available from Quail Ridge as well as industry-specific wood chip and cement mill elevators. Quail Ridge elevators feature conservative design for capacity and power and heavy construction. A variety of take-up arrangements and accessories are offered by Quail Ridge. 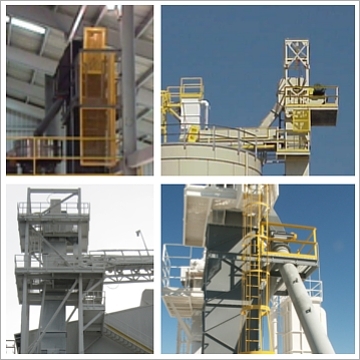 Platforms, hoist beams, and ladders are standard options with Quail Ridge bucket elevators.